In a previous blog post, Teaching Letters: Sorting, we discussed the importance of moving away from the old practice of teaching one letter per week to exploring, teaching and integrating letter instruction into through more holistic, meaningful experiences. One strategy for teaching the names and sounds of the alphabet letters is through frequent, repeated readings of ABC books. However, we need to be intentional about which books we are choosing for the specific objective we want to accomplish. Aspect to consider when choosing an ABC book…. Do the words listed include the sounds that you are teaching? Some books use blends instead of the single consonant such as bread for B. One book even uses knight for K! Some books use a mixture of long and short sounds for the vowels which might be confusing to children. A couple of books I have examined even use air for A or artist for A. With intentional choosing of books and guidance from the teacher, we can use ABC books effectively to help expose, practice and explore the letters and even all 40 sounds of the alphabet. The most common or frequently used sounds each letter? Exposure to or knowledge of lots of sounds including blends and digraphs? The most common or frequently used vowel sound? Exposure to or knowledge of lots of vowel sounds including diphthongs and r-controlled vowels such as A is for artist? I do wish that the author would have written the word that begins with the letter in lowercase as we want from our students and just highlighted it instead of using uppercase letters. You could use whiteout tape over each letter and have the students help you write the lowercase or simply point out that the author chose to add capitals to show the letter of the alphabet but that is not how we write. Letters are shown in an easy to read font. 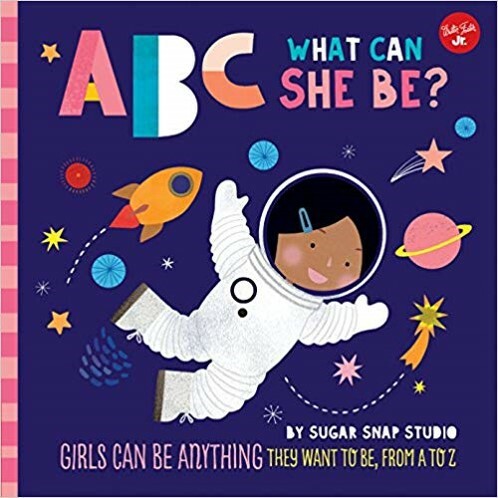 ABC: What Can She Be? An awesome book for exploring a variety of careers and practicing the names of the letters but not for the most frequently used sound. For example, C is for Chef. One long sentence as the mouse constructs the alphabet. Great book for an extension of action verbs. Displays the uppercase letter large on the page- great for reviewing letter names. A simple format of one word per letter. Some of the vowel sounds are the long sound and some are the short sound. Some of the letters contain blends such as frog for F.
Displays both the upper- and lower-case of each letter. Great extension for counting of the animals on each page. This IS a good book for beginning learning of the letters of the alphabet and their most commonly used sound (except A which is A is flying in an airplane.) As with the book, Q is for Duck, you will need to point out that the author chose to add capitals to show the letter of the alphabet but that is not how we write. Love how it adds physical movement to learning the letters of the alphabet. When we include movement, learning sticks. Be very careful about words that the first sound is not clear. For example, in the word “elephant”, students often hear the /L/ sound instead of the /e/ sound. Make sure to overemphasize the /e/ sound. All three of the above books contain a storyline of an adventure for the lowercase letters of the alphabet. Great book for pointing out and naming the letters of the alphabet- both upper- and lowercase letters.